Start a bluebird trail in your yard or around your garden with help from the Heartwood White Bluebird Bunkhouse Bird House. This delicate roost not only offers bluebirds a lasting home, it also brings a crisp hint to any setting with ease. The square body has plenty of room for a bluebird family, and the 1.5" diameter entry hole helps them reach the interior. Cypress shakes cover the roof, which extends downward and overhangs the entry hole, helping keep water out of the nest. The front panel opens easily for nest checks, and a slot on the base drains any captured water. The internal temperature remains comfortable for birds via the ventilation gap beneath the roof overhang. The flat back and attached hardware allow for mounting to virtually any vertical surface, such as a post, wall, or fence. 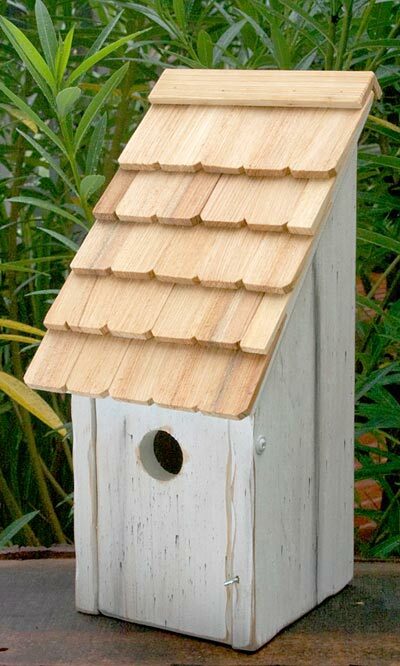 Crafted of durable cypress, this home will protect nestlings from the elements while remaining lovely for several seasons. Its antique white finish enhances any garden, for your delight. Help bluebird populations thrive with this White Bluebird Bunkhouse Bird House. Made in the USA.